This is the recipe for a lovely staple sourdough tin (or free-form) loaf that I find myself making rather a lot at the moment. Basically I guess its because its easy, and tasty. Its just really nice bread, plain and simple! In preparation, you will need 60g sourdough starter at the peak of its cycle. Mix the starter into the water in a small-ish bowl then beat in the flour til its fairly smooth (its not critical, just mix it all in well together). Cover the bowl with clingfilm and leave in a safe place at room temp overnight. Mix the levain you prepared in with the water. Separately, sieve the flours into a large mixing bowl and add the salt. Stir to spread the salt throughout the flour. 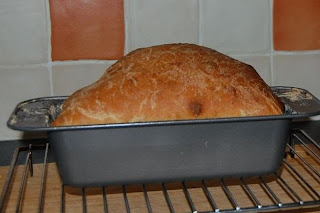 Now pour the water and levain onto the flour and follow Dan Lepard’s Handmade Method. Ok, sorry that link isn’t to some neat instructions on Dan’s technique – but if you buy the book you’ll get all the detail along with loads of interesting recipes and notes on bread generally. Basically its a minimal knead technique, which respects the slow fermentation of sourdough, whilst leaving you free to get on with other bits and pieces during the day. The loaf in this recipe would be ready to bake at about 4 hours after you mixed the ingredients together. Baking depends on the form – if its free-form, then expect to cook on baking stone that’s well preheated, at Gas 9 for 10 mins followed by 20 mins at Gas 6/7. If its in a tin, Gas 6/7 for 35 mins will do.